Successfully Added High Power LED Headlamp - 5W XPE LED, 1200mAh Battery, IPX4, 2 Light Modes to your Shopping Cart. The brightness of this LED light is 130 lumens which are more than powerful enough to show you the way at night. Thanks to this light you will never lose sight of your path. This light has an IPX4 rating, so it protected from water ingress if used on rainy or wet days. The battery of the lamp is 1200mAh and provides a good amount of lighting. You can charge the battery of the light fairly quickly with the included charger. This is a lightweight headlamp so it won't weigh you down. The adjustable head strap makes it comfy to wear for all and this will free up your hands. 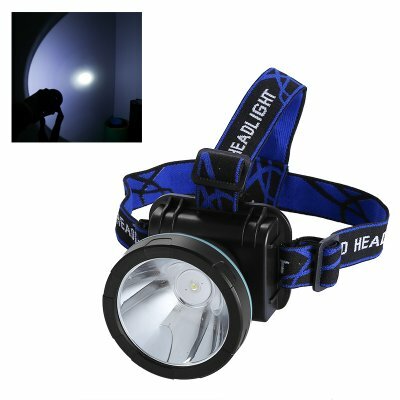 This a great choice for a headlamp as it offers high power LED light. You can increase visibility at night and keep yourself safe. This LED headlamp comes with 12 months warranty, brought to you by the leader in electronic devices as well as wholesale LED lights and torches..